Martial Law ‘Right around the Corner’. However, right now we are under a silent martial law and citizens are reporting strange and unexplainable activity from the US armed forces and multiple federal agencies that point to a covert preparatory operation to completely lock down America in the very near future. The US military are secretly moving massive amounts of “equipment” across the country consistently for more than a year. In Phoenix, Arizona, tractor-trailers transporting tanks on public highways have been spotted. One witness stated that he saw these flatbeds multiple times in the month of June. Eye witness reports are coming primarily from the northern and southern Border States. Peter Santilli, an ex-marine informant who was a specialist in aviation deployed weapons, explains that a refrigerated truck, allocated by the administration department on base, was directed to the commissary, where the unsuspecting driver believed that he was transporting food. The weapon was placed at the head of the trailer, and covered up with either food stores (like cans of soup) or body bags. In the event that the truck is stopped en route, the weapon would be well hidden and go undetected by inspectors on the public highways. If there were problems concerning potential civil unrest, he was to radio into his superiors for aid by either air or ground support. Should the situation warrant serious attention; crowd control methods would be implemented. One possible scenario was the use of cluster bomb units (CBUs) that will emit upon detonation, a “sleep and kill” chemical weapon that will not disturb infrastructure, but is lethal to all living things within the effected zone. Santilli describes these particular 3 unit CBUs as shaped like water-heaters with a coned top and plunger-like device. Once deployed in the air, a parachute assists these CBUs to the targeted area. And when detonated, a deadly chemical gas will kill every human and animal in the specified cordoned area. The acquisition of armory by the Department of Homeland Security (DHS) and contracts for bullet-proof glass for check-point booths to be positioned strategically throughout the nation on public highways have heightened awareness that the US government is preparing for a well-planned domestic military action. 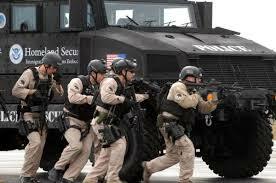 DHS armored vehicles have been sighted on highways in Kentucky. Residents in Pine Mountain, Georgia and Spruce Mountain, Nevada have had confrontations with US armed forces. When travelling in public national forested areas, military police with “automatic weapons” say that locals cannot gather wood in surrounding forested spaces (as they have traditionally done for decades). One man in particular had his rifle forcibly confiscated by unidentified armed men. Information coming out of reserve units in Arizona is that they are being put on official alert. Military personnel are being told by superiors not to schedule vacations and prepare to be on-call and on-duty indefinitely. According to one informant, these new assignments are not providing for deployment overseas, but rather for domestic service with the intimation that these deployments may have relation to civil unrest expectations.